Blue and red lights disco-dancing across the walls wake her; she watches the raid from her bedroom window. A white van with an official-looking crest. Two agents in black jackets with reflective letters. She shrinks behind the curtain. Only a sliver of scene is visible, and the only light on the street that hasn’t burned out blazes a cold glow. The letters on the jackets seem to spell out the feeling of the night: I-C-E. Jeanette clutches her bathrobe tight. The neighbor woman dragged out in handcuffs is still in her pajamas. On her pants, Minnie Mouse on tiptoe with hands clasped at her face, hearts of varying sizes exploding in the air around her mouse ears, a print that repeats. Jeanette’s breath creates little spirals of fog on the window. One agent, a woman with a burst of auburn curls, shrugs her jacket closed with one hand, while the other holds the chain that links the woman’s handcuffs. No shouts, no screams, no tussle. The agents and the neighbor woman walk in silence to the van, lights still spinning like Fourth of July fireworks. The male agent slides the door shut with a bang. The rumble of the engine. The cloud puff of exhaust. Tiny wires criss-cross all the windows so Jeanette cannot see inside the van, cannot see the neighbor woman as the van drives down the road past every blacked-out townhouse window and makes a right, disappears out of sight. The whole thing takes only minutes. Jeanette tries to fall back to sleep but cannot. She rubs lavender oil on her wrists, takes a tab of melatonin. Lies there, eyes open, for what feels like an hour. Finally she dials the number, making sure to press *67 first so the call is untraceable. Mario answers in a sleep-clogged voice. Mario answers because Mario always answers, no matter the time of night. And even now, six months separated and six months sober, Jeanette still feels the rock in her throat as she waits for the click, the familiar voice. No need for pleasantries or pretense. No need to even announce herself. Of course it is her. A sigh on the other side. A rustling of sheets. A sound like a snap. Turning on a light? She can picture him. He sleeps shirtless and in boxers. She can picture the print of the sheets, the color, the smell of just-washed. The pile of library books on his nightstand. The color of the walls. They picked it out together: eggshell Bavarian cream. What’s he reading these days? She thought she was calling him to talk about the raid, the neighbor woman. Turns out she has nothing to say about that. Also turns out: Sobriety is a daily exercise, especially at night. She pictures her nightstand of just a year ago: crushed OxyContins, grapey cough syrup to send her pain-free into morning. A kind of prayer. She pulls the covers to her chin. Wonders what real prayer she’d whisper if she were the kind of woman who prayed. What she knows about the neighbor woman: likely in her thirties, probably Central American, comes home each evening around six or seven in a pink smock with a caddy of cleaning supplies. She has burnt-sugar skin and dark black curls. Always her face is perfectly made-up. Arched eyebrows. Deep brown lips. Eyelashes that curl up like flower petals. Unmarried? Jeanette has never seen her with a man. Or a woman, for that matter. Or a friend. She has never seen anyone with the neighbor woman except a young daughter who gets dropped off every night around eight. What happened to the daughter? She realizes she hasn’t thought about the daughter. Each time, the driver who drops off the daughter doesn’t get out. The little girl just runs up the steps to her door and knocks. She is around six or seven, Jeanette guesses. Occasionally their paths cross when she and the neighbor woman are in their driveways. They say hello to each other, the daughter smiles. They’ve never talked more than that. And now, after the raid, the blood orange of a Miami morning like any other. Of course she is still in Miami. These streets run through the blood—all pastel mini-mall suburban blight, tropical flourish to each dragging second, each concrete bungalow a kind of American dream achieved, no matter how crooked the mortgage. Miami as façade, as a crumbling beneath, as what is left after the hurricane. No other place calls her home like this. It’s just another day in another home, not that different from the one she shared with Mario, only Mario isn’t here. Jeanette sets her laptop on her kitchen table beside the window. This gives her a view of the neighbor’s house. All day she’s on her headphones listening to a psychiatrist define patients by insurance number and ailment. Obsessive compulsive disorder. Hypomania. Schizotypal personality co-occurring with generalized social phobia. She types furiously, occasionally pausing the tape to search her DSM for spelling and billing codes. She makes a note to order the newest version. She microwaves a Light and Lean meatball parmesan with a side of matchstick veggies. She smokes cigarette after cigarette even though her AOD counselor has warned her to stop because “reliance on any substance or drug is a slippery slope to relapse.” Outside: silence falls, a slow domino effect, cars leaving their driveways until the street is empty of all but Jeanette’s. A few rustling trees. An occasional lizard or bird. No sign of the neighbor woman. No sign that anything at all happened the night before. By evening Jeanette is done with her transcription work, has emailed it to her temp agency. She readies for dinner, browses the freezer, hums a Top 40 tune, Rihanna or Beyoncé or Adele. She glimpses a car driving up to the neighbor’s house. The neighbor’s daughter gets out. The car U-turns around the cul-de-sac and heads away from the house. Jeanette thinks about rushing out and stopping the car. Explaining that the little girl’s mother isn’t home. But her body freezes as her mind weighs possibilities, questions, her role in any of this. She looks out the window. A little girl stands before the neighbor’s door in purple leggings and a flowered polo. She holds a pink backpack with both hands. Stares up at the door. Knocks. Stares. Knocks again. The girl scans her surroundings and her eyes stop at Jeanette’s kitchen window. They stare at each other. What can she do? The cold grass crunches beneath her bare feet. The waves of breeze come and go, rustle palms. There is a look of mild amusement or apprehension or both on the girl’s face as Jeanette approaches. As she invites the girl into her home. The girl is uncertain, frowns as Jeanette kneels before her. The girl hesitates, but then takes Jeanette’s open hand. She lets Jeanette lead her into the house, where she climbs onto a kitchen chair and places her backpack at her feet. Her legs dangle. She is silent, fiddles with a ruffle at the hem of her shirt. Andrea blows into the opening of the Hot Pocket while holding it with a paper towel. She pauses, places the pastry down. Andrea regards Jeanette in a manner that makes her suddenly self-conscious. As if Andrea knows something isn’t right. As if Andrea thinks Jeanette knows more than she’s giving away. As if Andrea can see right through her. Alternatively, the mother is working for a drug dealer. She was busted by the DEA and picked up by Immigration. The mom caught a whiff that something was up and left her daughter at the babysitter’s overnight. She’s calling a relative or a friend right this moment to pick her up. Someone will show up any minute now. Jeanette is embarrassed at her own problematic assumptions. She should know better. Andrea takes a bite. She chews. She swallows. Monosyllables. One-word answers. Jeanette opens her fridge. A moldy cube of cream cheese. Preshredded Monterey Jack. White Cuban bread. She pours Andrea a glass of tap water. Feels shame at her conclusions, her stereotyping. Does it even matter why her mom was picked up? Still, a child at her kitchen table. Still, shame that she never even asked her neighbor’s name. She hands Andrea a cup of tap water. Jeanette closes the door to her bedroom. She lies back on the bed and balances her laptop on her stomach. Google searches: What happens to children if their parents are deported? She gets a link to Child Protective Services. She gets a link to family detention centers in the region. To lawyer after lawyer after lawyer. Another search: How to find someone detained. An Immigration and Customs Enforcement database that requires Alien Identification Number of the detainee. No phone number she can find. Lawyer after lawyer after lawyer. A light knock on the door. Andrea has to pee. Jeanette shows her the bathroom and makes up her mind that Andrea will spend the night. In bed, Jeanette wakes, gasps, and holds her breath. Feels her heart thump. Almost like loving Mario, wanting to run to Mario. She holds the feeling like a single bullet. No, she’s gotten too far to break. Outside, a thunderstorm clicks fat raindrops over dying, sick banana leaves. Jeanette turns to her side. Some nights like this—she isn’t even aware of it, how her fingers find their way to her nightstand, how they search for a bottle, a healing rattle. She curls an empty fist beside her and tucks it beneath her head. Andrea sleeps in the small room beside her own. Jeanette strains to listen but hears nothing. Places a hand to the wall as if it will pulse with an answer. Wonders if Andrea can’t sleep either. Andrea has been with Jeanette all morning, watching TV shows, following her around, doodling in a notebook while lying on her belly in the spare room where she slept. Jeanette’s mother got here an hour ago. She visits on Saturdays. Since leaving Mario, since rehab. Never missed a weekend yet. Jeanette’s mother runs a finger over the containers before her. One holds rice and beans, the other Jeanette’s favorite dessert, arroz con leche. Her mother never shows up without food she has made the night before, claiming she has made too much, that she doesn’t want a refrigerator full of leftovers. Jeanette’s mother raises her hands and shakes her head. A look Jeanette has grown accustomed to. Her mother. Pearls, slacks, wrinkle cream, a box of blank Thank You notes. Always put together. Always carrying a whiff of her own success and composure like a cardigan at the shoulders. You look at her and just know: Here is a woman who has answers. So often Jeanette has wondered how she came from such a woman. So often she’s felt both gratitude and embarrassment on her behalf. Jeanette: always a woman on the verge of cracking. You look at Jeanette and think: Here is a woman who has stories. Not that Jeanette’s mother doesn’t know the wounds of loss herself. But it’s a different kind of loss. Jeanette’s mother grew up among the Cuban elite, the First Wave, the exiles who gave up homes, gave up businesses, gave up riches to run from communism at the start of the revolution. Jeanette suspects there is a deeper loss, too, one her mother won’t express. Her mother laughs with abandon sometimes before catching herself, before recasting her face with dignity, composure. Jeanette suspects a different side of her mother, a smooth easiness unworn by the hard edge of new worlds, lapping at the shore of the life she abandoned. Jeanette has seen this loss in photos browned with age, her mother’s youthful gaze like time will never stop, like the future is an abstraction, a given. And Jeanette has wondered if loss unspoken becomes an inherited trait. “What are you going to tell him when he visits on Monday?” her mother says. Jeanette’s mother smiles, but her cheekbones stay in place, her skin pulls. She cups the espresso in her hands. “Someone will come for her before then,” Jeanette says. She can hear Andrea giggling at the TV in the living room. After her mother leaves, Jeanette and Andrea walk to the park. Jeanette tapes another note to Andrea’s door with her phone number in case someone shows up while they are out. Hand in hand they stroll to the minuscule playground: two swings, slide, seesaw, water fountain, one bench. No other children are there, so Jeanette joins Andrea at the other end of the seesaw. All day the girl’s been asking questions. About her mother, where she is, when she can go home. Jeanette didn’t tell her mother she’d made up a lie, that she’d said Andrea’s mother phoned and asked her to keep her for a while. Why? Andrea wanted to know. Why not? Jeanette had answered. Each time Jeanette lifts her weight a little, the seesaw sends Andrea floating down. Each time she sits, Jeanette hits the ground with a thud. She thinks Mario is crying. She hears labored breathing, shaky shuddering. She knows this routine. Knows what comes next. Jeanette wants to cry, too, but is always afraid that if she lets it happen, she will never stop. That if she lets the pain seep, she will need something, someone to stop the bloodletting. Only one way to kill pain. And then the weight of it: the daily exercise, sobriety. How it drags at her feet, keeps her chained to herself. Jeanette shakes her head no, because when Mario speaks the words, then they are real. Then she is the battered ex-girlfriend, she is the fists-to-the-face that really happened. That other life that feels so distant now. All she can feel when it’s just two voices across an expanse is the knowing that still survives. The body her fingertips memorized, the universe of a relationship. All its language and borders and landscapes. A geography she studied for years and still does not understand: a man who pummels a fist into her side the same day he takes in a kitten found lying in the crook of a stairwell during a rainstorm. Nobody knows about the fights that got physical. Nobody knows these phone calls still happen. She thinks of Andrea in the next room, listening to the credits. Thinks how even the best mothers in the world can’t always save their daughters. Andrea wakes in the night and comes to her bed. Asks if she can sleep there instead. They lie face up, blinking into the darkness. Andrea turns. She is just a small lump in the bed. A tiny cocoon. Her eyes adjust to the dark. Jeanette turns, too, and can see Andrea’s face, brown and smooth. A little button nose. Stringy hair spread around her like a crown. Jeanette searches for words, thinks of the weight of Andrea’s story and tries to find an appropriately serious response. But Andrea fidgets and yawns, seems to give the moment little importance. Andrea giggles and turns to smile. She knows her mother is right. She knows nobody is coming for Andrea. She makes phone calls in the morning barefoot, T-shirt bunched at her hips, huddled in the hazy light of her room. She is not surprised the United States Citizenship and Immigration Services offices are closed on Sunday mornings. But she is surprised the woman who answers the Immigration and Customs Enforcement hotline can’t find Andrea’s mother in the system by name and asks for an Alien Identification Number in monotone. “Oh, well, then, visit our website for more information.” The silence, when the woman hangs up, is unbearable. Jeanette finds the numbers of immigration lawyers who are much more eager to speak. They are attentive. They have questions. How is she doing? they ask. How is she holding up? It’s a question Jeanette is used to. Her answer—“Fine”— is automatic. Jeanette can only squeak out an answer. Andrea is at her kitchen table drawing on blank sheets of printer paper. Jeanette has no crayons, no markers. Andrea said she preferred a blue pen anyway. It’s a disappointment, maybe it’s selfish, but Jeanette holds onto the word dear like a blip of accidental humanity caught in a stranger’s throat, a version of the dust that swirls in a sunbeam that lands across her bed. She slips into a dress. She tiptoes past the kitchen. Jeanette can hear Andrea’s pen scratching the paper in violent strokes. Her parole officer: He, too, will sit at her kitchen table. He, too, will scratch pen on paper. Pen on paper. It all comes down to paper. Jeanette knocks on the door of the neighbor on Andrea’s mother’s other side. “Do you know the woman who lives next door?” she says to the mustached man who holds a forty-ounce. Jeanette points toward the neighbor’s house. Jeanette remembers that Andrea’s mother worked every day, even Sundays. She’d see her in that same pink smock, with that same caddy of cleaning supplies. Just as the mustached man is about to close the door, he pauses. Jeanette stands in the street and dials the number. She looks back at the mustached man, smiles and nods. He just watches her. And Jeanette thinks about how she wants to ask him to shut the door, but she’d never ask him to shut the door. Two rings, and a woman with a cigarette-husky voice answers. A dog barks in the background. A baby cries. Jeanette tries to explain. “Oh,” the woman says. “Yes, I’ve heard of this happening before. Have you called the police? What is the student’s name?” The man at the door slides his thumbnail over the tab of his beer. He looks at his nail. “I— Andrea,” Jeanette says. She’s not sure why she opts not to tell the woman Andrea’s last name. “I’m sorry to bother you—” Jeanette says, ready to end the call. She assumes everyone wants the person on the other end of a call to end it. “I’m so sorry to bother you,” Jeanette says again and ends the call. The man asks for her phone number as she turns to leave, and Jeanette doesn’t answer but instead thinks cleaning caddy. She thinks arched eyebrows, and she thinks impossible choices, and she gets the sensation that Andrea’s mother already knows about her, already knows she will disappoint. She thinks impossible choices and she remembers, remembers so deep it hurts, why she never thought mother of herself. “I’m sorry,” she says, and she’s saying it to every mother in the world, but the man at the door doesn’t understand, he is not a mother and he is just nodding. It starts to rain as Jeanette makes her way back to the house, and she sees Andrea peering out the window. For some reason the image of a tiny face through a rain-smeared window, a tiny face so full of expectation, makes her remember: She has missed her NA meeting. Jeanette stops, lifts her face to the rain. Will she tell her parole officer? He will want to know why, and he will assume it’s because she doesn’t want to get better, doesn’t want to let go of Mario, doesn’t want to see another day. She will tell him, and he will be disappointed, but she is used to disappointment. She doesn’t want to lie. Jeanette doesn’t rush back. She lets the rain patter down around her, soak through her clothes, run into her tennis shoes. It feels good to punish herself. To stand shivering and cold in an empty street. Her AOD counselor told her once that the only love she seems to know what to do with is the kind of love that breaks a person over and over again. Wet, squeaking through her house and leaving muddy footprints, she takes the phone to her room. But she doesn’t call Mario. She closes her eyes and tries to remember the opiate rush, the watery calm, the hit to the brain. His voice in her ear: “Don’t you feel every molecule that surrounds you? Everything is holding you now.” She doesn’t call him after she’s called the cops. She doesn’t call him even when the police car pulls up and she hears Andrea call her name and her heart is thumping in her chest and she feels for the first time, no, this is what it’s like to break. 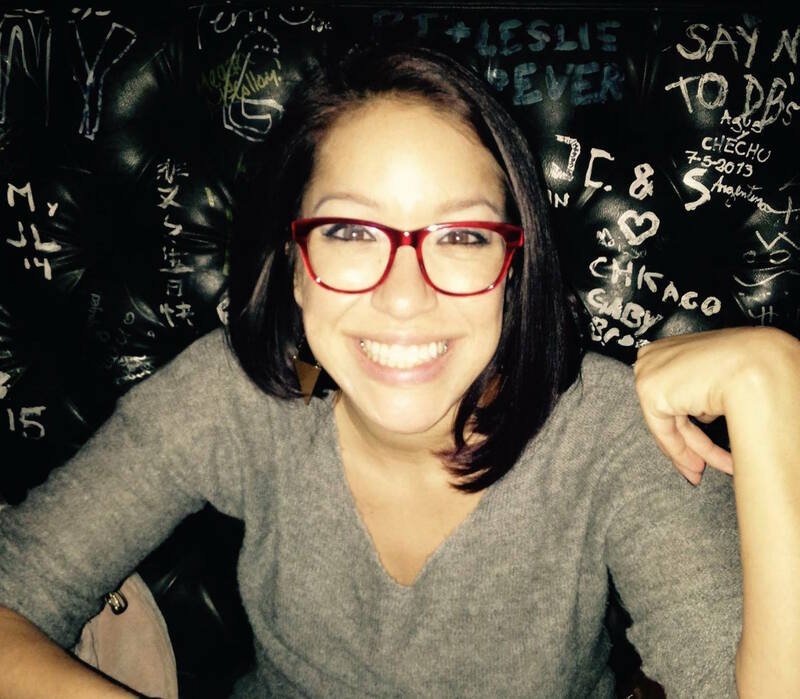 Gabriela Garcia’s writing has appeared or is forthcoming in Iowa Review, Tin House’s Open Bar, Michigan Quarterly Review, Cincinnati Review, Black Warrior Review, Ninth Letter, and Indiana Review. She received an MFA in fiction from Purdue University and is currently at work on a novel. She Tweets about mostly cats @GabiMGarcia. You can also find her at www.gabrielagarciawriter.com.